I see the implementation of new swing aspects at this point in the journey akin to a behavioral change. It’s similar to eating healthy or taking up a new workout routine or spending 30 minutes a day learning a new language. You know that sticking to the plan and working at it will eventually lead to where you want to be, but it’s easy to revert to past habits and allow stasis to take over. In the past there have been a couple occasions where I planned out a specific change and then after working at it for a period of time (which I thought was substantial enough) I arrived at a place where I needed to play competitive golf and ended up reverting to older habits or getting stuck in the limbo that is half old half new, which typically results in golfing death, because I had not fully ingrained the new habit/change. I recently found something in my swing, a new feel, that produces the shots that I have been gunning for. Nice high slight draws and baby fades that start close in line with and finish at the target. I’ve played a slinging draw for the past 6 or 7 months without really knowing why, but I finally realized that through a different feel in my wrists during the takeaway I can get the club more on plane. Long story short, it’s good and I like it. So now comes the implementation period. I worked it on the range for about a week while slowly starting to venture out on the course and the results were increasingly encouraging. 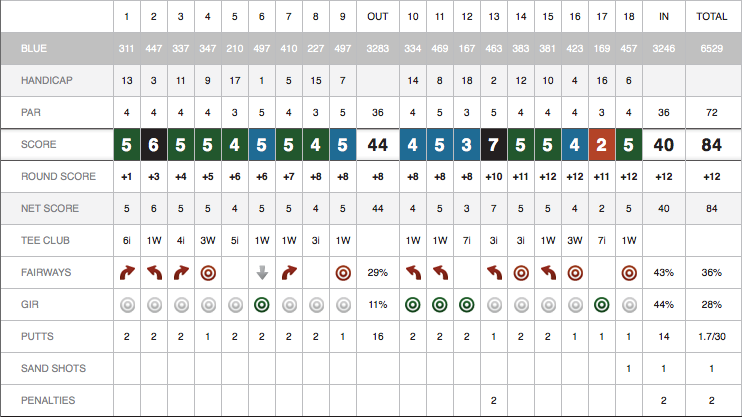 Then I began to play 9 and eventually 18 holes with just the new feel in mind and the results kept coming in positively. I still don’t have a great feel with my tee shot so I am missing a lot of fairways, but with the irons it is pretty comfortable. A lot of the problem with my tee shot, too, is that I am used to aiming down the left side and slinging it back to the right, but now that I am playing a pretty straight shot I am ending up in a lot of trees out at Riverside. I just need to learn to aim down the fairway and trust that it will go where it is supposed to. It was a funny round as I missed almost every fairway, but when I had a look at the green I was hitting it really well and close to the pin. I missed three putts from about 5 feet and had an unplayable shot on the 18th which ended up as a bogey. outside of that it was a solid round where the new swing was really starting to pay off. I was pretty excited as it felt like effortless power and the ball flight was sweet. My playing partner, who I had never played with before, commented about how good a round could have been had I been able to hit some decent tee shots. It’s always great to have obvious flaws as you know exactly what you need to work on. I have faith that with the new swing once I get a better understanding of impact positions with the longer clubs things are going to step up to the next level. 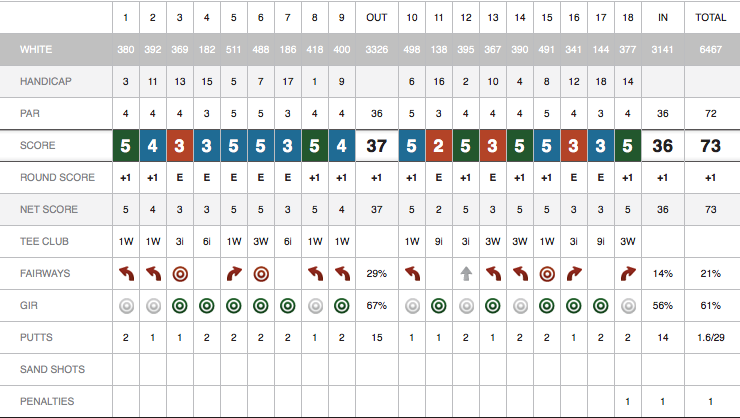 The next day, though, I struggled to “find” my new feel and it wasn’t until about the 9th hole where I started to realize exactly what I was wanting and needed to do. The entire round I could have very easily reverted to my old swing and gotten around the course much better, but you have to give these things time and you have to be able to play through the crappy rounds in order to really find what you are looking for. I technically hit more fairways than the day before, but my misses were much farther from the fairway and often in a spot where I could not get a good punch out. And, the irons were not treating me like they had the day before as I could not quite find the new spots in the swing. I hit a couple good shots, like the birdie on 17 from a 170 yard 7-iron that landed 2 feet from the hole and a few good saves for bogeys, but all in all the round was about sticking with the new regardless of the outcome as that will come with due diligence and time. Both bad and good shots are part of learning and in a lot of ways we can improve more from sticking to our guns and working out the kinks during rounds like today’s. There are a lot of bumps along the way; figuring out what you want to do and then sticking to it regardless of the immediate outcomes is the secret formula for improving. 10 Responses to "Facing the learning curve"
If slow motion movies are taken for every driver shot made in an actual round of playing with the resulting trajectories recorded, it can be used to analyze the driver swing. Because the rear elbow stays close to the side of the body during the backswing (unlike many modern players who let the rear elbow to swing pretty far from the side of the body during the backswing,) the rear elbow may need to be close to the body during the address position as well. When the rear elbow is far from the body at address, and when it is brought close to the body during the backswing, the leading forearm, and the leading hand can be twisted (rotated) back by the action of the real elbow shifting back closer to the body during the backswing. This used to be called “rolling” the arm(s) during the backswing, which will open the clubface more during the backswing. The rolled arms will have to be rolled back during the downswing to close the extra opened clubface back to square. This may be the reason for having to “sling” the extra opened clubface back to square during the downswing. Keeping the backswing “on plane” may help to promote not rolling the arms back, but having the real elbow changing positions from far away from the body during address to closer to the body during the backswing will tend to roll (twist and rotate clock-wise for a left hander) the arms and hands during the backswing to open the clubface an extra amount during the backswing. It may be interesting to try (slowly and carefully at first) the interlocking-grip for the driver instead of the overlapping-grip (Vardon grip,) as many of the topmost modern players use the interlocking-grip. For accuracy, the overlapping-grip needs the leading arm, and leading hand to dominate the swing with a high degree of leading side control. If the leading arm and leading hand cannot provide a high degree of control, an inter-locking grip may offer better control, as the two arms and two hands can work together more closely to increase control. Who is Richard Chen – is he a golf teacher – and if not what is his handicap? I love the guys who come on here and try to coach Dan… he’s got a coach. The 73 is good stuff. I’d take a hot round and a high beta right now. Keep up the good work! hello dan! First before somebody ask me who i am if i am a golf teacher and what is my handicap.my name is not important and i was a golf teacher for almost 6.5 years 2 days a week 3 groups a days helping a pro with large groups. my handicap was +3.7. take me 13.5 years to active then car accident 5.5 months before trying for pga . my mentor was a pga player at that time.take me 8 years to be able to swinging again. my drive before accident was 320-325 now its 235-240 my engery is permanent so i can not hit never hard again so i hope if i can say something to help him and to wake him up i be happy.i know what it take to go to that level .73 with 3 fairways is way to low for dan gold, 50% green hit is way to low to.dan is not playing on a 150 slope or + 7000 yards golf course.he as to improve is practice a lot.maybe is target at the range is to large? or he don’t practice enough face controle?maybe try to play to much traight shoots won’t say more please wake up dan.sorry again for my english i know it is not good. It does not matter what your English is like, Normand. Anyone with a +3.7 handicap should command attention! Sorry to hear about your bad luck but congratulations on your fightback. Question 1 is this: Have you continued to track your ability to score from within 60 yards or to get up and down when you miss the green? With a wedge in your hand, how does your game compare with that of the low-cappers you play with? Question 2 is slightly different and it somewhat contradicts the premise of Question 1. As I think you know, a lot of the recent research on Strokes Saved indicates that the biggest indicator of success on tour is NOT actually wedge and putter play but accuracy with longer irons. Somewhat counterintuitively it seems that hitting it “close” from 175-225 may be more important than how well you play on or near the greens. So I wonder how much this has factored into your short- and long-term planning? While I recognize the need to fix your driving, after you learn to drive straight and long (275-290? on manicured courses), further improvement will come much more from other facets of your game. Good to hear from you. To answer your questions, I do spend a lot of time on the short game and am always working on improving with those “scoring” clubs and am pretty darn good from 150 yards and in. In particular, I have a very solid wedge game from within 100 yards. I don’t blog about that so much as it’s the longer sticks that have been my Achilles for some time now as you mentioned. Improving my driving accuracy is very similar to improving from the 175-225 range and what I am working hard to improve is basically full swing long sticks. As the driver swing improves, so does the woods and hybrids; they are all very similar. I never let the short game sit by the wayside, though and am always working on improving that part of the game. I should blog more about that. Swing and setup the long clubs like the short clubs when the short club swings and setup are good. It may sound a little strange, as common sense may say that the long clubs being the “power” clubs ought to be used with a different “power” swing, and a different “power” setup than the short clubs: like swinging much faster, and much harder with the long clubs, like taking the back swings really far back, like setting up with the hands and arms extending really far out from the body to get the maximum swing arc with the long clubs, and trying to really kill the ball by going really all out with the long clubs. Nicklaus says to use one basic swing, and even one basic setup for all clubs short and long. He takes this one-basic-swing-and-one-basic-setup-for-all-clubs-short-and-long concept quite literally. He says to place the ball near off the leading heel for all clubs long and short. Sam Snead in his “The Driver” book said to swing with 80% of available power to maintain control. In my book, a simple mathematical formulas for the amount of “power” needed for short and long clubs to generate specific ball distances are formulated. For the long clubs, power = one-third ball distance wanted. For the short clubs, power = three-third ball distance wanted. The above two formulas say that the long clubs can cover the same distance as the short clubs with only a third of the swing effort. This is because the long clubs send the ball out at a lower trajectory. This means let the long clubs provide distance naturally. The setup for the long clubs has the basic shape as the short clubs in most cases for the top players. The leading arm hangs fairly vertically with the hands fairly close to the body for both the short and long clubs. The stance is wider for the long clubs, although Jones had a fairly narrow stance for all clubs. In the older days, a closed-stance is usually used for the driver setup, while an opened-stance is usually used for the shortest clubs. The swing temple, and speed is governed by the kinetic swing sequence, which is one-stage simpler for the short clubs so that the short clubs can be swung faster, while the long-clubs have an extra kinetic swing sequence stage of leveling out the clubhead before impact, so that the long clubs have to be given a little more time during the swing. The long clubs have to be swung smoother. I highly recommend using video analysis software where you can do side by side and draw lines and circles. Kinovea is free for the PC. I use Analyzr on OS X. Kinovea has many features but is balky. Analyzr is easy and gets the job done fast. It’ll make your emphasis on comparisons of old and new swings much clearer. And you’ll take videos from consistent DTL and FO views.